The color of this healthy soup is just beautiful. It is a bright emerald green. It’s made with wholesome foods to fuel your body. When you eat better you feel better. The quality of your food matters - pick organic and the freshest foods available. Place in a bowl. Decorate with chopped mushrooms and cilantro and add fresh lemon juice. Enjoy right away. * As the name implies, phytonutrients are nutrients in plants (phyto = plant). They're concentrated in the skin of many fruits and vegetables, and are responsible for their color, scent and flavor. They are thought to be a plant's immune system. A twist on the popular Gazpacho, this is a very tasty blend of raw fresh veggies, herbs and spices that is done in no time. Blend everything in a high speed blender (line Vitamix). Pour into a bowl and add garnishes and serve at room temperature. This is a very old Transylvanian recipe, passed down through many generations and a staple in many kitchens. One can’t say enough about this broth’s health benefits. Try it and see how your body thrives on this natural collagen. 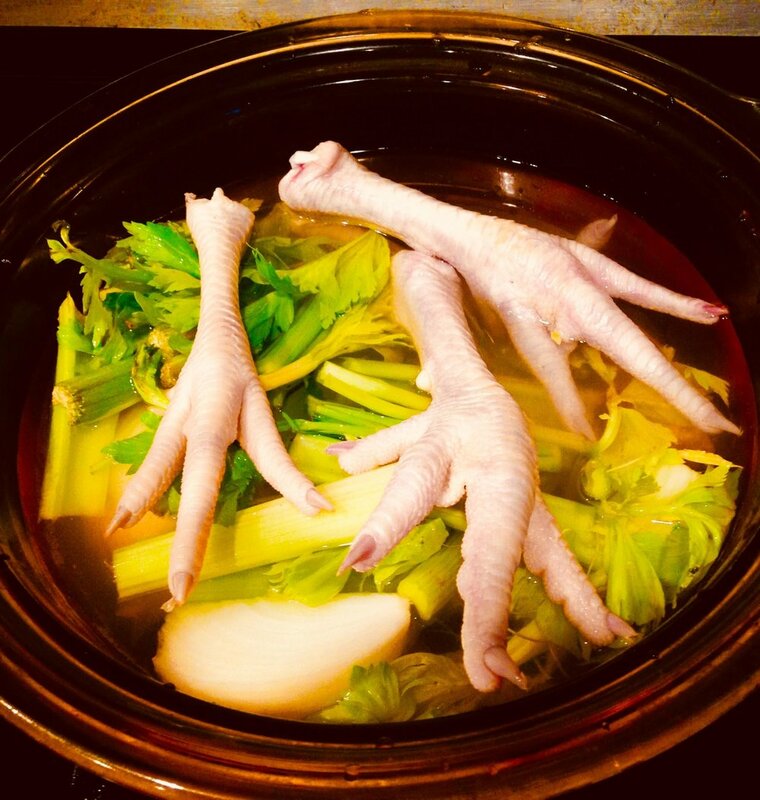 The key is to use the best and freshest organic ingredients and to use lots and lots of patience simmering the chicken bones (and feet) to extract the collagen. During cooking, collagen undergoes hydrolysis (a chemical reaction in the presence of water) that converts it into gelatin. 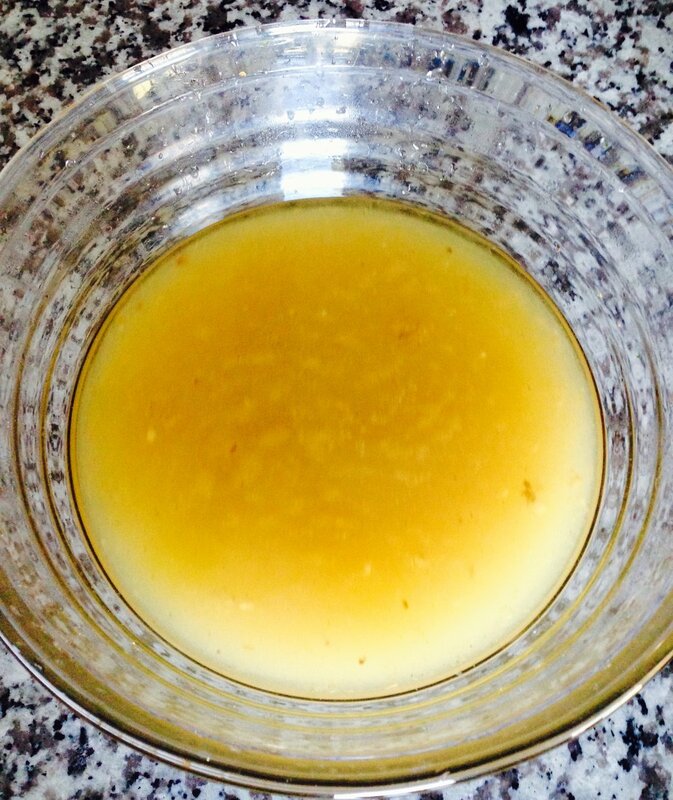 Gelatin is the most prominent nutrient in this broth. This soup is not just a terrific healing soup, it’s lip smacking delicious! You can have it everyday for lunch. Serve it with a slice of fresh organic lemon. Using a stove top glass pot with a glass cover will avoid any mineral contamination and allows one to see the beautiful bubbles and reactions going on inside the pot. Place all of the ingredients but the boosters in a large, stove top safe glass pot. Let sit for 30 minutes so the apple cider vinegar can get to work. Bring to a boil and then turn down the heat to a very low simmer and remove scum with a spoon. Simmer covered on very low for 12 to 18 hours. Strain through a fine strainer, return back to a low simmering and then add any optional boosters. Continue to simmer for another 15 minutes. Turn off the heat and let sit for few more minutes. 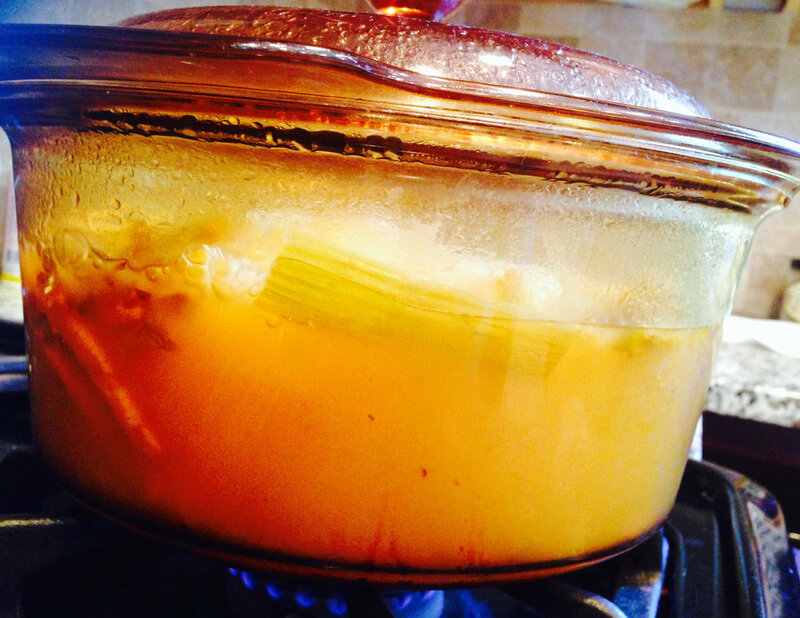 Now the soup is ready to enjoy or to save in glass jars for up to 5 days in the refrigerator. This soup is so rich and creamy and packed with minerals and vitamins including a high dose of vitamin A and lots of live enzymes because it's mostly raw. The taste is amazing and it's done in just 2 minutes! 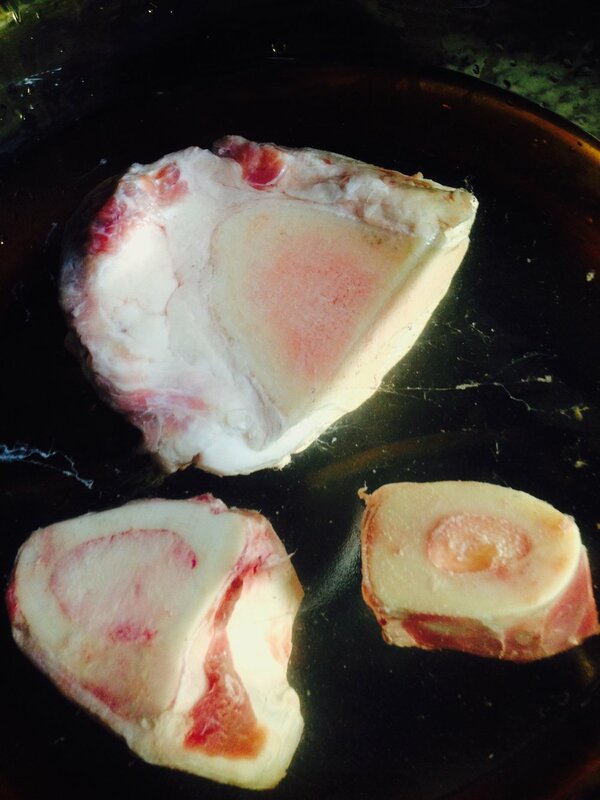 Heat the beef bone marrow broth until gets close to boiling point. Put broth in a high speed blender (like Vitamix) together with the rest of the ingredients except the fresh herbs (sage and mint) and blend well until smooth. Be careful because the steam will expand the liquid so start slow and gradually increase speed. Garnish each bowl with the fresh sage and mint leaves and enjoy!